A new year comes up with great changes, new ideas, and new resolutions and brings along happiness with it that we want. We get to live another year with joy and fulfill all that we haven’t gain in the last year. All those wonderful things that we couldn’t get are now within our reach once again. New Year is a chance of making all the wrongs right, rewriting the history. Same months and dates would come in the New Year and all we could do is, make something turn into gold this time. So just celebrate the rebirth of the moments and try to enjoy it to your heart’s content. New Year comes with great challenges and goals to be fulfilled, but then again it also comes with the season of celebration. So why are you waiting for inviting your friends and family? This is your time to enjoy your time too. So start having fun and have the celebrations planned on your own. 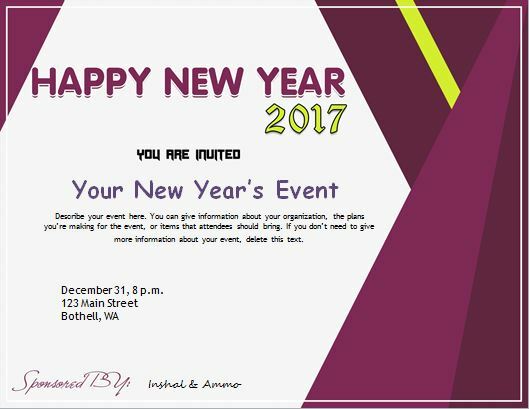 The New Year’s Day celebration invitation template we have designed will help you bring all your loved ones together. This template is designed very carefully and with all the possible effort that could be put so as to make sure that when you send in these invitations, your friends and family share the similar spirit as you have. New Year is a time of celebration of new ideas and most importantly growing, so does it with bit style of yours by taking our help. You can edit “[Event Name], [Event Description], [Event Details] and [Sponsored By]. 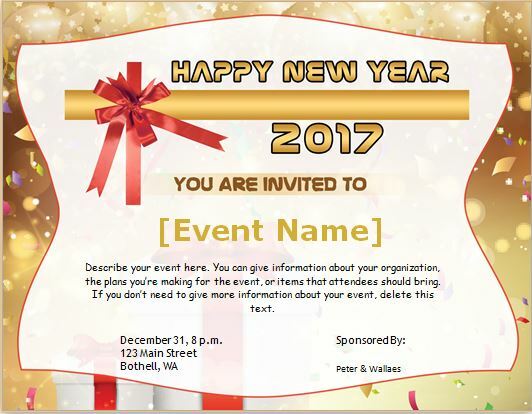 You can edit “[Your New Year’s Event], [Event Description], [Event Details] and [Sponsored By].